Mickey Truck Bodies has appointed Mike Asbury in the newly created role of Corporate Continuous Improvement Manager, where he is partnering with the company’s manufacturing teams and senior management to identify and execute process improvement opportunities throughout the organization. He reports Matt Sink, VP Manufacturing and Director of Corporate Operations. 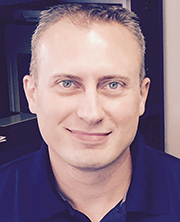 A Certified Lean Six Sigma Black Belt, Mike most recently was with Knapheide Manufacturing Company, a manufacturer of work-ready vehicle solutions from Class 1 up to Class 8, where he was Corporate Continuous Improvement Manager responsible for all 24 company locations. Knapheide was founded in 1848 and is currently managed by the same 6th generation Knapheide family. Mike earned a Bachelor of Science Degree in Computational Physics from Illinois State University. “Mike has a proven track record of driving positive change by removing constraints within organizations and processes,” says Matt.